The Honorable FRANK McCLOSKEY, who served in the U.S. Congress from 1982 - 1994, an unprecedented six terms from the 8th District of Indiana, will receive Military Honors and his cremains will be interred at Arlington National Cemetery on Tuesday, February 10, 2004. The immediate family, his wife of nearly 41 years, Roberta; his daughter, Helen; and his son Mark, invite those who wish to attend to the memorial service at Ft. Myers Chapel on the grounds at the cemetery at 10:45 a.m. to a luncheon reception for those attending the services from 12 Noon to 2 p.m. at the Georgetown home of Jeff Richardson and to a Captiol Hill reception held by "Friends of Frank" at 2167 Rayburn. Ms. McCloskey asks that those wishing to attend the luncheon, wanting more details or who wishing to send memories of her husband for his family notify her at robmclo@ aol.com by 8 a.m., February 9, 2004. The family would like to publicly thank Madeleine Albright, Chairman of the National Democratic Institute and all staff of National Democratic Institute for their suppport and acknowledgement that he was a tireless proponent of democracy and peace. They would also thank the U.S. Congress for their renaming of a Bloomington Post Office in memory of his work on the Post Office and Civil Service Committee. He was also a member of the House Armed Services, supporting those who serve in the military, and foreign affairs committee, fighting for human rights in the U.S., Ireland, China, and Iraq as well as Bosnia. Ms. McCloskey wishes to also thank the Bosnian Embassy and the Bosnian community in Chicago and Saravejo for their condolences given at his memorial services in Bloomington on November 15, 2003. Frank McCloskey, an Air Force veteran, journalist, mayor and U.S. Congressman, died on November 2, 2003. Francis Xavier McCloskey, a Representative from Indiana; born in Philadelphia, Pennsylvania, June 12, 1939; graduated, Bishop Kendrick High School, Norristown, Pennsylvania, 1957; A.B., Indiana University, Bloomington, Indiana, 1968; J.D., Indiana University School of Law, 1971; United States Air Force, 1957-1961; newspaper reporter; lawyer, private practice; mayor of Bloomington, Indiana, 1972-1982; elected as a Democrat to the Ninety-eighth Congress (January 3, 1983-January 3, 1985); reelected to the Ninety-ninth Congress pursuant to H. Res. 146, taking his seat on May 1, 1985, and reelected to the four succeeding Congresses (May 1, 1985-January 3, 1995); unsuccessful candidate for reelection to the One Hundred Fourth Congress in 1994; died on November 2, 2003, in Bloomington, Indiana. BLOOMINGTON, Indiana., November 3, 2003 — Frank McCloskey, a six-term congressman from Indiana who spoke out for human rights in the Balkans, died here on Sunday. He was 64. The cause was bladder cancer. 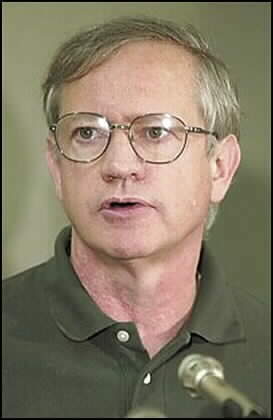 Mr. McCloskey, a Democrat who represented the Eighth District, in southwestern Indiana, from 1983 to 1995, made several trips to Bosnia during his years in Congress, and in 1992 called for selective air strikes against Serbian forces if they continued their siege of Bosnia-Herzegovina. He later criticized the Clinton administration's handling of the Bosnian conflict, warning that Serbs were committing genocide in Bosnia. Mr. McCloskey entered politics in 1972, when, as a third-year law student at Indiana University, he ran for mayor of Bloomington. He outpolled a former mayor in the Democratic primary and defeated the Republican incumbent in the fall. He served as mayor for 10 years and was credited with obtaining federal money to help improve city services and revitalize downtown. Mr. McCloskey was born in Philadelphia on June 12, 1939. He went to high school in Norristown, Pennsylvania, and entered the Navy immediately after graduation. After his discharge in 1961, he joined The City News Bureau, a news service in Chicago, and later The Bloomington Herald Tribune, where he covered politics and City Hall, putting himself through college and law school. In 2002, Mr. McCloskey was named director of Kosovo programs for the National Democratic Institute for International Affairs, where he was teaching leaders how to govern democratically. He is survived by his wife of more than 30 years, Roberta, and their two children, Helen and Mark. BLOOMINGTON, INDIANA — Former U.S. Representative Frank McCloskey, whose legislative district included Lawrence County, has died after a year-long battle with bladder cancer. He was 64. McCloskey, a Democrat who represented southwestern Indiana's 8th District in Congress from 1983 to 1995, died at his Bloomington home Sunday afternoon with family and friends at his bedside. He had been released from Bloomington Hospital Oct. 28 after an 11-day stay as his health worsened. The redrawn 8th District includes Martin and Greene counties in this area. Lawrence County has been moved into the new 4th District, while Orange County is part of the 9th District. McCloskey was remembered this morning as a legislator who stayed in touch with his district. Al Walker of Bedford was chairman of the Lawrence County Democratic Party during a portion of the time McCloskey represented the district. Walker said today, "Number one, as a party official, you had to like Frank because he was a good campaigner. He wasn't afraid to go out and try to get the people to vote for him. Secondly, he always had time for his constituents." Stan and Martha Nice of Paoli have worked on the staffs of Indiana congressional and senate representatives and came to know McCloskey many years ago. Martha Nice said today, "I appreciated his sincerity, his commitment to the people of Indiana and, most importantly, (his commitment) to do the right thing. I've been involved with a lot of different people in government over the years, and nobody equaled him in that. ... He was just a good friend." She added, "He just wanted to touch base with the people. He always wanted to sit down and have a cup of coffee with people. I can't tell you the number of times he would just show up at the house." The district, during the time it included Lawrence County, had a history of bitterly fought races. McCloskey played a role in political debates becoming a part of the legislative campaigns waged in the 8th District. The first such debate was in 1986 and came to be known as the "Great Catfish McBate." It featured then-8th District seat contenders Rick McIntyre (now Lawrence Circuit Court judge) and McCloskey. McCloskey narrowly defeated McIntyre. The first debate, like subsequent ones, was organized by Steve Deckard, editor and publisher of the Shoals News. Deckard also has served as the president of the Indiana Democratic Editorial Association, which meets annually in French Lick. McCloskey was honored during a breakfast at this year's event. Deckard said a video about McCloskey's life was shown during the breakfast. "What came home to me (in watching the video)," Deckard said, "was that he said one of the most enjoyable events in his tenure was his participation in the Great Catfish Debate." McCloskey was an outspoken champion of Bosnia during his 12 years in Congress. To the end, friends say McCloskey remained passionate about politics and about the power of a single vote — something he knew plenty about having once been re-elected to Congress by a mere four votes. Born in Philadelphia in 1939, McCloskey went to high school in Norristown, Pennsylvania, and entered the Air Force immediately after graduation. He served until 1961 before coming to Indiana University in Bloomington. McCloskey worked as a reporter for The Indianapolis Star, the Herald-Telephone in Bloomington and the City News Bureau in Chicago before graduating from IU in 1968 with a bachelor of arts. He was elected mayor of Bloomington in 1972, a year after he graduated from law school at IU. McCloskey served as mayor for 10 years before being elected to Congress in 1982. He won re-election by just four votes two years later after five recounts in a race against McIntyre. He lost in the 1994 race that swept Republicans back into power in Congress. In 2002, McCloskey was named director of Kosovo programs for the National Democratic Institute for International Affairs, where he was teaching leaders how to govern democratically. Combs said McCloskey had been on the job only a few weeks in that post when he fell ill last year. McCloskey is survived by his wife of more than 30 years, Roberta, and their two adult children. Funeral arrangements are pending. Frank McCloskey, a former representative from Indiana and an outspoken champion of Bosnia, died on November 2, 2003, from bladder cancer. He was 64. McCloskey joined the Air Force right out of high school. After serving in the military for four years, he attended Indiana University in Bloomington and worked as a reporter for The Indianapolis Star, the Herald-Telephone in Bloomington and the City News Bureau in Chicago. McCloskey received his law degree from I.U. in 1971, and was elected mayor of Bloomington a year later. He ran the city for a decade before he was chosen to represent southwestern Indiana's 8th District in Congress. During his six terms in Washington, McCloskey was described as a quiet, rank-and-file Democrat who worked on the House Armed Services Committee. Although it gained him nothing politically, he developed an interest in the Balkans after making several trips to the region. In 1992, McCloskey called for selective air strikes against Serb forces that were committing genocide in Bosnia. He also demanded that Serbian leaders be ousted and tried for war crimes. Serbian President Slobodan Milosevic, who was ousted in 2000, is currently on trial in The Hague, Netherlands. After losing reelection in 1995, McCloskey became chairman of the Morgan County Democratic Party. In 2002, he was named director of Kosovo programs for the National Democratic Institute for International Affairs. Frank McCloskey: McCloskey, 64, a former congressman and Bloomington mayor, died November 2, 2003, after a long battle with bladder cancer. From 1983 to 1995, he served in the House of Representatives, representing Indiana's 8th District. In 2002, McCloskey was named as director of Kosovo programs for the National Democratic Institute for International Affairs, where he taught leaders how to govern democratically. An Air Force veteran, he was buried in Arlington (Virginia) National Cemetery.